I earned Swagbucks for posting about this promotion. If you join any of the links provided below, you’ll become my referral and I’ll earn while you earn. Being honest right out of the gate. Before getting this email from Swagbucks about Green Monday, I don’t think I have ever heard of it. Have you? Am I just the last to know about it? But I love sharing when you can get some extra cash back by simply joining Swagbucks. 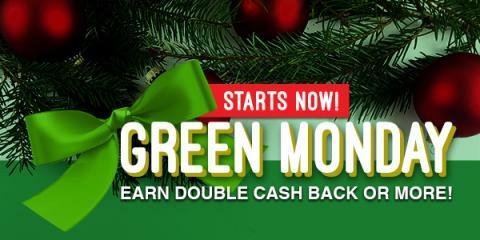 Today Green Monday with Swagbucks earn a bunch of extras. Check out all the details below. You can earn money while saving it during Green Monday! The Cashback Shopping site Swagbucks is offering big cash back – 2x or more – at a number of different stores today only (December 11, 2017). They’re also offering big payouts on a variety of different deals and offers from companies that would make great gift ideas. Get great deals without waiting in lines or even leaving your home! As a special bonus, if you sign up through me you get a 300 SB ($3) bonus when you earn your first 300 SB before January 1st! This site’s a great way to extend your shopping budget, especially around the holidays!